If you are having trouble keeping up with your bills, one of your options might be consolidation of your bill payments. Our Debt Management Plan (DMP) allows you to make one payment to all your creditors. Your creditors may be willing to stop collection action, lower payments and even reduce or eliminate interest and fees. Free, confidential consultations with a professional counselor are available weekdays, evenings, and weekends. No matter where you live, we can help. We offer counseling by phone and we pay for the call. During your hour-long session, your counselor will review your income, expenses and debt in detail in order to determine your best options for becoming debt free. Call us at 800-777-PLAN Monday through Friday between 8 a.m. and 5 p.m. (Pacific Standard Time), or email us and we'll call you back to schedule the appointment. Please include your referral source in your email. To design the most effective plan for becoming debt free, your counselor will need to know your monthly income and living expenses as well as how much you owe to each of your creditors. Prior to the session, we suggest you complete our Client Worksheet so the session can be spent analyzing your information. These documents will help you make your DMP a success. Your DMP will help you repay your debt in a structured, affordable manner. If you are able to occasionally or consistently pay more than your minimum required DMP payment, please do so. You will shorten your repayment period and pay less interest. If you live in one of the following states, there are additional requirements that are included in your Debt Management Plan Agreement. There are many debt counseling agencies on the web. Why should I choose CCCS of SF? As a consumer, you have lots of choices. While there are hundreds of debt counseling organizations across the country, Consumer Credit Counseling Service agencies are members of the National Foundation for Credit Counseling and have agreed to quality standards that include accreditation, certification of counselors, audits and core policies that ensure quality service. CCCS agencies not only offer a Debt Management Plan, but are committed to providing comprehensive money management information and counseling – we're not just debt consolidators. Specifically, our organization, CCCS of San Francisco, is one of the largest agencies in the country. Our staff includes experts on housing, credit reports, financial planning and just about any personal finance topic, so no matter what your situation, we can offer information and solutions to help you master your money. Although we are based in San Francisco, we provide our services nationwide and offer weekday, evening, and weekend appointments for your convenience. Whatever choice you make, counseling services should be absolutely free. If you do choose to consolidate your bill payments through a service, you can expect to pay a small monthly administrative contribution, usually between $1 and $35, depending on the monthly payment to your creditors. While many debt counseling agencies receive all their funding from creditors, we get support from various sources. Currently we receive funding from creditors who make contributions to us, HUD and other businesses and organizations who award us grants, employers who pay us for employee services like on-site workshops, and various fee services we offer, including Credit Report Review and STRATEGIES financial planning. While all of our counseling services are free, we do request a small monthly contribution from our DMP participants to cover the costs of administering the Plan. How do I know that I wouldn't be better off filing for bankruptcy? That is a decision you'll have to make yourself, and there are many things to consider. Bankruptcy is the worst thing to have on your credit report and can affect your ability to buy or rent a home, buy a car, get a job, or obtain life insurance. If you plan on moving, changing employment, or making a major purchase, a bankruptcy on your record could make things difficult. That's not to say that you shouldn't weigh all your options. Just make sure you have enough information to make the wisest choice for your particular situation. How do I determine if I should pay my creditors on my own or pay them through your Debt Management Plan? If you have been missing payments or making payments late, you may benefit from our Debt Management Plan. Reduced payments will fit into your budget easier, allowing you to meet credit obligations while covering your housing and other living expenses; lower interest rates and waived late and overlimit fees mean more of your payment goes toward principal; and reaging of your account means your credit report starts looking better right away. Also, consolidation under the Plan means no more calls from creditors and no more juggling bill payments. If you're really not sure which way to go, try assessing your situation with our budget worksheet. You can recalculate your spending plan by plugging in different numbers based on where you think you can increase income and reduce expenses. 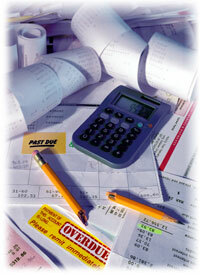 Depending on the outcome, you may choose to participate in the Debt Management Plan. Will participating in the Debt Management Plan ruin my credit report? Participation in the Debt Management Plan won't ruin a credit report, and may even have a positive effect on your credit rating; it all depends on your current situation. If you have an absolutely perfect credit report now, then sending reduced payments to creditors or getting interest concessions through the DMP could put a blemish on your report. A creditor may report a reduced payment as late or may insert a line stating payments administered by credit counseling agency. If your credit report already reflects any late or missed payments, then the DMP will likely improve your record by facilitating consistent, on-time monthly payments. Also, through the Plan, many creditors re-age your account, meaning that even if you were late in the past they will report you as current as long as you make all your monthly payments on time through the Plan. And once you graduate from the Plan after having paid off all your debt, we will help you reestablish credit. Even if your credit report is perfect now, you must ask yourself how it will look after a few months of trying to go it alone. If you are visiting this website because you are starting to feel the pinch, how much longer can you continue making full payments (at full interest rates) on time? If you feel like you're going to start making payments late or missing them altogether, then at least make an appointment for a free counseling session. The counselor can discuss your credit report concerns with you and can go over your budget to see if there is some way you can continue payments on your own.